I went to sleep with the view of the grand waterfall out of my window and when I awoke and saw it still there, I realised it wasn’t a dream. This was the 60-metre high plunge waterfall Seljalandsfoss, one of the most spectacular in Iceland and a large drawcard for visitors. We were in the south of Iceland, on the second day of our eight-day Iceland Ring Road itinerary and I for one couldn’t wait to get started. Located just off the Ring Road, it’s an easy day trip from Reykjavik being only 120 kilometres to the east. Our biggest tip would be to try and get here as early as you can to avoid the crowds that come with the non-stop tourist buses that will begin to arrive mid-morning. Being independent and doing our own road trip through Iceland meant that we were in an enviable position and able to pounce early to make the most of this beautiful location. Seljalandsfoss is part of the Eyjafjallajökull glacier, the one that we can’t spell but remember it being responsible for closing down the airports for what seemed like an eternity back in 2010. The geological history shows that the cliff face from which it falls was once part of the rugged Icelandic coastline. Today, whilst still visible from Seljalandsfoss, the coastline is some distance away. It is a narrow but forceful waterfall that culminates in a reasonably small pool at the bottom of the cliff. The key feature of Seljalandsfoss, however, is the ability to walk behind it, which we couldn’t wait to do. This unusual feature is why it’s important to get here early if you can. Whilst walking around it can be done at any time of the day, it’s so much better to be able to do it in silence, without a pack of people pushing and shoving in front and behind you. It’s perfectly serene here when no-one else is around. You can take time to take some photos and you can take the time just to sit and watch, being mesmerised by the non-stop flow of water. It’s loud behind here as the water crashes into the shallow pool below, and it’s wet. Very wet. 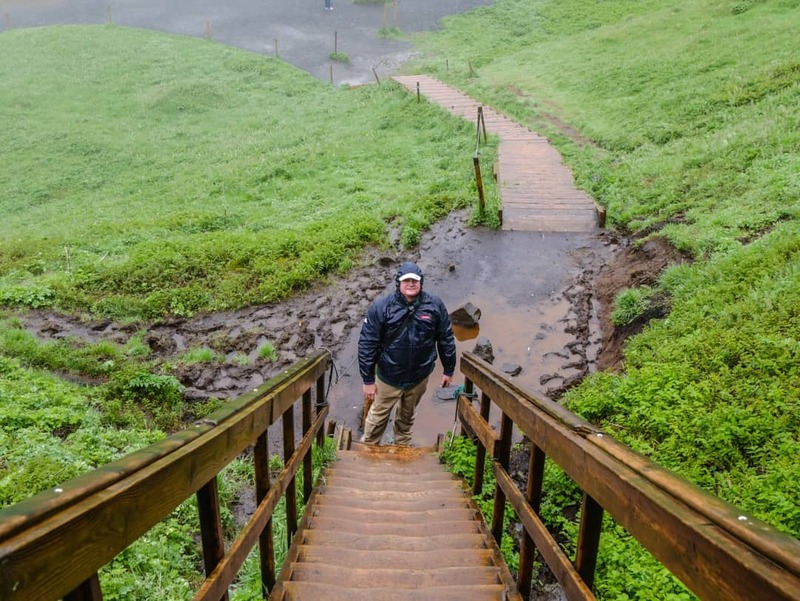 Prior to coming here, we’d read a few tips that indicated we should wear a rain jacket as there’s mist around. Let me tell you there’s more than a bit of mist. Depending on what part of the waterfall you are at can mean the difference between a little mist, some heavier spray and something a whole lot more. Add some wind into that and there’s a chance you will end up completely soaked by the time you do the circuit. We had rain jackets on but our jeans got soaked most of the way up our legs. If you are carrying expensive camera equipment, you should also take some protective covering. I know I sound ancient when I say this too, but it is essential to wear good shoes that have decent grip. Most of the parts around the waterfall are wet and of course, when rocks and water come together it can get very slippery and muddy too. There are also steps to get up and down which also require some good grip. We also came across the beautiful Icelandic horses here. We would later see them everywhere. With kind eyes and long hair, they are the prettiest of animals. They are also performers, happy to show their teeth at any given time. There is a small paid parking area available just off the Ring Road and there are bathroom facilities also. Entry to Seljalandsfoss is currently free. An official camping site is located approximately two kilometres from Seljalandsfoss. If you don’t have your own vehicle, there are numerous tours that you can choose from that start and end in Reykjavik. As if one amazing waterfall in one day wasn’t enough, a short drive of less than half an hour to the east brought another of Iceland’s epic waterfalls into view. Skógafoss allows for multi-level viewing. Dropping 60 metres into the river below, the flat terrain allows visitors to walk right up to it, experiencing the full might of the water drop. At 25 metres wide, it pumps out some serious spray. If I thought you got wet behind Seljalandsfoss, getting up close and personal with this one will surely soak you to the bone. Most people tend to stay at a reasonable distance away, taking in the full width and height of this incredible waterfall and dipping their toes into the icy water. This is definitely a waterfall that you should also try to get to as early as possible. Once the tourist buses pile in, it’s difficult to get a clear shot of the waterfall from the ground due to the inordinate amount of selfies being taken. I have nothing against selfies, but waiting an hour whilst someone waits for that perfect “hair moment” is bound to set me off. For a different perspective, head to the stairs on the right-hand side of the falls to the viewing platform. This spot is worth every one of those 370 steps. Here you can witness at a very close range the force of the water coming from the Skógá River, fed by the Eyjafjallajokull and Myrdalsjokull glaciers. The air up here is clear and fresh. This magical countryside of Iceland is on display here in a 360-degree view. Rainbows form over the top of the falls, celebrating the presence of the sun’s rays. There is off-road (gravel) car parking available. Entry to the carpark and the waterfall is currently free. In a country covered in ice and glaciers, it’s not surprising to see such waterfalls, but to be able to engage with them at such close proximity is really something else. They are also everywhere, so it’s possible to not only visit the well-known ones but to find little secrets of your own along the way. This is another reason why independent road trips are so great. As we drove further east and the dark skies gave way to pastel blue, we saw a sign indicating there might be a glacier closeby. A quick look at a map didn’t show us anything of significance. With no set plans for our day, it took only seconds to take a quick left turn off the Ring Road and onto the D221. I think my constant saying over the next hour was “I can’t believe we can get this close to a glacier!”. I was seeing it for myself but barely believing it. The D221 bumps along for about 20 minutes. Even though the distance isn’t far, this is a gravel road with plenty of potholes and driving can be a bit slow. Remember also that if you are driving a rental vehicle that it should be covered for driving on such roads. Here we were able to walk right up to the Sólheimajökull Glacier on a track that runs alongside the glacier. Tours can also be conducted to walk out on the ice. You should never do this alone. Whilst we don’t see the glaciers move, cracks and crevasses appear in locations that can never be predicted. There is a carpark at the end of the road, and walking up to the glacier is just short of one kilometre. It was as though Mother Nature knew we were heading to a location known as a black beach when the skies turned black overhead once more. With dark, moody skies and angry waves crashing down onto this black sand beach, I felt as though we got to see it at its most natural. With a strong wind blowing northwards from the Atlantic, we parked our car facing into the wind, for fear of the doors being ripped off. It does happen! With my woollen hat and a big jacket on, we braved the winds. This was summer. I can only imagine what it dishes up in the winter months. The impact of Iceland’s volcanic activity can be seen very clearly here. The black sand is really black pebbles or small rocks, created when the boiling hot lava hits the cold ocean. The reaction is immediate, with the molten lava solidifying and turning into the pebbles. They are light but there are millions and millions of them, making the beach an interesting thing to walk on. The basalt columns are what I really came here for and they didn’t disappoint. Formed from a contrasting process to the beach, the columns were the end result of lava cooling over a longer period of time. There’s a specific and detailed geological reason as to how this actually happens. Simply, however, the lava cools and as it does so, it contracts and under the right conditions, cracks form, leaving these columns behind. There are also some cool caves further along the beach where you can see some cool rock formations. It’s great to be able to spend time down here, watching the waves crash onto the shore and really just taking in this incredible coastline that wraps around the beach on both the eastern and western sides. People are generally fascinated by waves and these ones here at first glance, seem to fit the bill for potential adventure. Who doesn’t love putting their toes in the ocean, or walking along the edge of the beach where the waves leave their foamy footprint behind? Oceans are also great for swimming….aren’t they? Despite the continual flow of people that we saw head into the water’s edge, including the elderly and small children, these waves are not for any of the above activities. Well, not if you want to make sure you can continue to enjoy travelling and doing the other things you love. These waves are dangerous. With a naturally strong current and wave sizes that can be affected by onshore winds, they are difficult to handle in their own right. The more sinister part of these waves, however, is their undercurrent and the fact that they develop a “sneaker” wave every so often. They aren’t uncommon. People are used to getting down to where the usual waves are breaking but with these waves, they will push right past the previous line, pushing well up the beach and grabbing whoever is in its path. People actually die here and yet there are still those that think it’s funny to taunt it just to get a video or photo. They will be the very people who expect others to risk their lives and try to save them should they get caught. It might sound harsh but I have zero tolerance when it comes to people who actively disobey serious warnings. There is a restaurant and facilities here. Avoid the usually long queues for the paid toilets outside and head inside to the cafe. There is plenty of parking available here also. Currently, both the parking and entry to the beach are free. Reynisfjara Beach is located near the small village of Vik, 180 kilometres from Reykjavik. It takes about 2 and a half hours to drive here. This area is like a desert plain, except its full of weird rock formations. 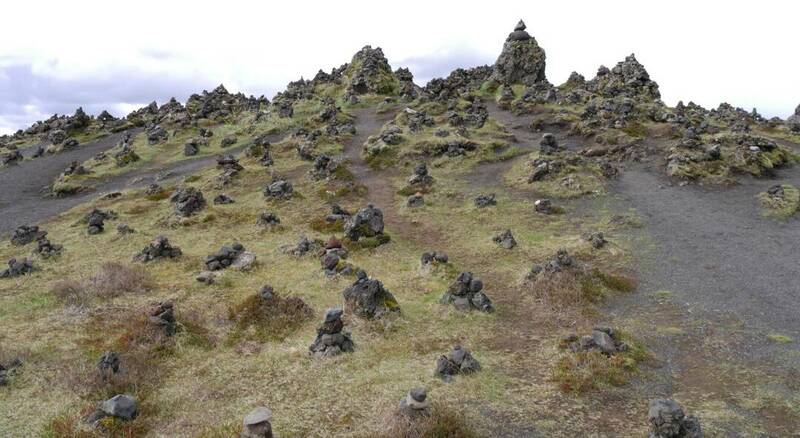 These rocks, known as cairns are good luck charms used by those who crossed the desert. Putting a stone or rock on top of another to create these landmarks was said to bring them good luck on their journey. As we turn back inland a little more from the coast, we see the rolling green hills once more. There are very few trees in Iceland but there is plenty of green grass. Lava also lines the landscape here, especially around Eldhraun, a location that had an enormous lava eruption in the 1700’s. Still recorded as one of the largest to ever occur in the world, it wreaked havoc on the animal and human population at the time. Now, it’s a lunar-like, moss-covered landscape that wouldn’t look out of place in some sci-fi movie. The drive east takes us past many tiny villages, most only with a few houses or barns in them. Sheds for animals and stock are built into the hills. They aren’t all in their sheds, however, with sheep wandering on the roads and shoulders constantly, having found a hole in a fence somewhere. We stopped at the town of Kirkjubæjarklaustur for lunch for two reasons. Firstly because there was no way I was going to miss checking out a town with a name I will never be able to remember again nor pronounce. Secondly, it’s the only town between Vik and Hofn that has a number of services including a restaurant. We were looking to have something a little different from the food we had been eating on board the campervan. 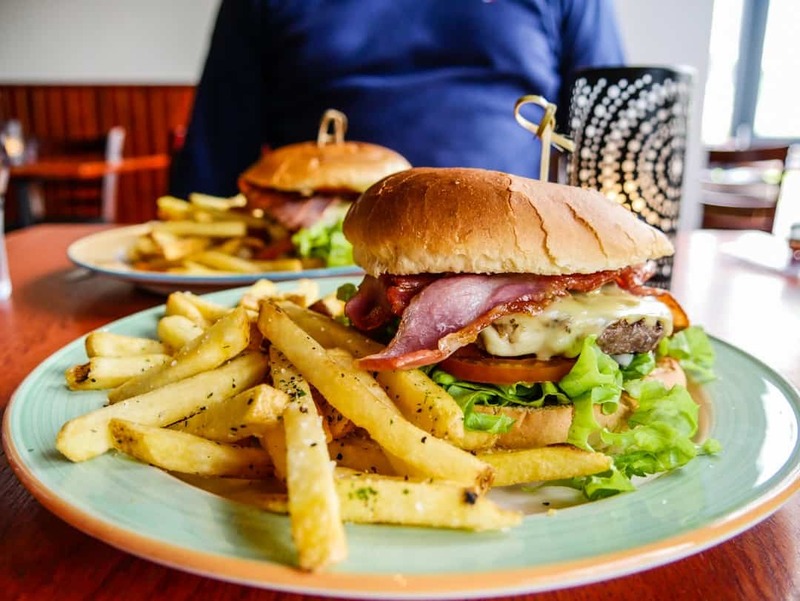 The food in Iceland isn’t anything to get very excited by, but this burger from Systrakaffi was damn good. A mini “Gullfoss” appears alongside Iceland’s main road, and the landscape starts to change once more. This time, the rolling hills have been replaced with flat black plains, covered in black pebbles as far as the eye can see. Having now experienced this type of landscape, it’s obvious to us that we are approaching the coast again. There’s no life on these plains. Soon thereafter we hit the glaciers. Sure, we’ve seen some already, but this is glacier town! They are everywhere. At almost every turn, I can see a glacier tongue or the peak of the glacier. There are 4WD tracks running off the Ring Road, and signs appear for glacier walks and other icy adventures. Another glacier tongue of the enormously spread out Vatnajökull Glacier is Svínafellsjökull. It was yet another example of a glacier that we could get out and walk alongside. Not having ever watched a single episode of Games of Thrones, I am told that this glacier appeared in season seven. We loved being able to see these glaciers more closely, noting the detail in the ice and the changing colours. The coastline flattens out completely, and the mountains of ice appear larger than ever before. We’ve entered the area covered by the Vatnajökull Glacier and it is breathtaking. As we approach Jökulsárlón, the glacier gets closer and closer to us. Icebergs, yes icebergs start to appear and I squeal with delight when I see a neon blue one. Soon, we see them everywhere. Small parking areas appear on the side of the Ring Road, providing a safe place to stop your vehicle and get out for a look. You can go down to the edge of the water and touch them. I will never forget Jökulsárlón. It will always remain one of my favourite places in all of Iceland. 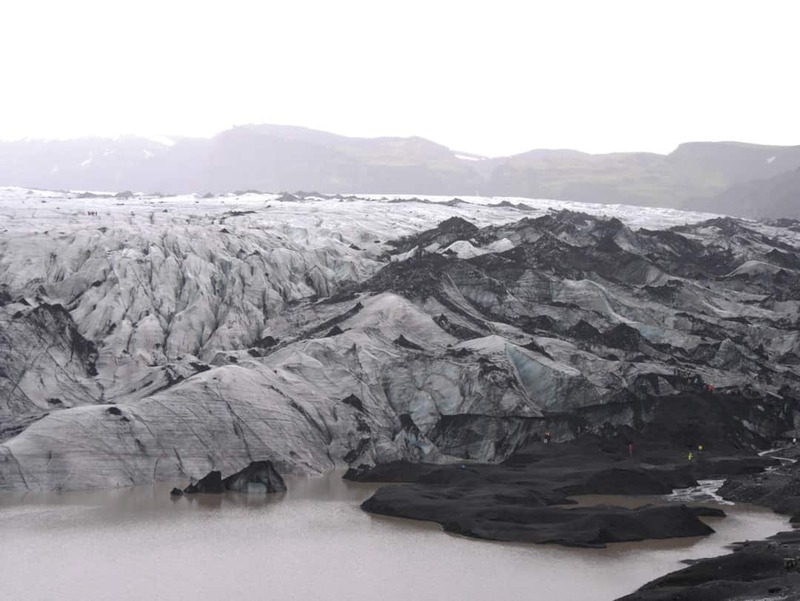 Here, the glacial lagoon is fed by the melting waters of the Vatnajökull Glacier, the largest in Europe. As the ice melts, it fills up the lagoon, full of pieces of broken ice. Some are small bits that float easily on the surface of the lagoon. Others are enormous icebergs, with more sitting underneath the water than can be seen by the naked eye. 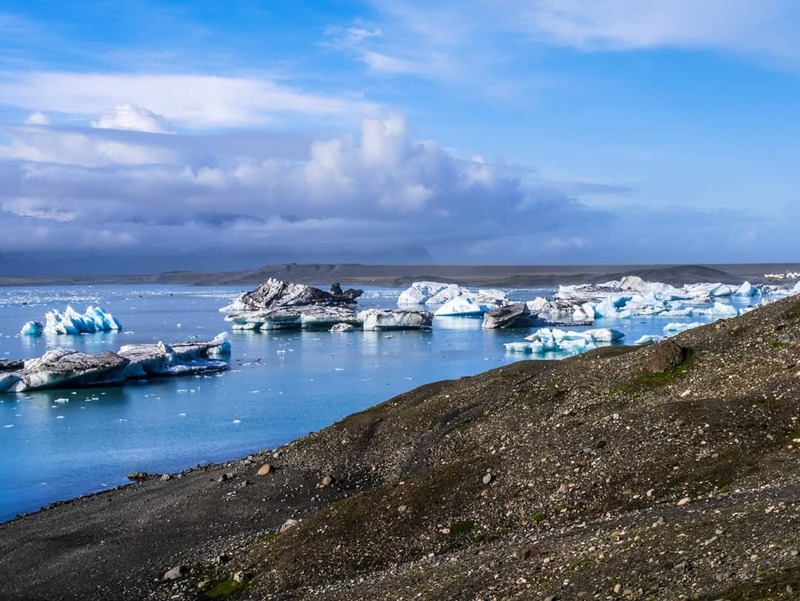 Zodiac and amphibian boats cruise around the lagoon, offering those on board a close view of the ice and an opportunity perhaps to see a seal or two. I’m just fascinated by the colour of the ice and to be honest the whole atmosphere here. You can book an amazing glacial lagoon tour here. Just when we thought this was as good as it gets, we found ourselves near the channel that connects the lagoon with the Atlantic ocean. Now the level of interest really increased. The channel current is strong and it picks up smaller pieces of ice, sucking them out of the lagoon and into the ocean. Sometimes the water overplays its hand, trying to pick up larger icebergs and move them along. Stubbornly, they don’t play the game, staying in the channel in a last ditch effort to stay in calmer waters. Eventually, they are knocked around by other prices of ice, the constant flow of water and pressure and they once again are moved along and edged closer and closer to the ocean. Piece by piece we sat and watched them participate in this great water theatre, an enduring and continuous process. Every angle gives a different perspective. From the gorgeous neon blues to black ice, holes, dirt and different shapes and sizes. It’s a forever changing landscape. No two days are the same. Across the Ring Road from the lagoon is the aptly named Diamond Beach. Pieces of ice that have passed through the channel and come to rest on the black sand beach shine like diamonds against the dark background. We stayed at Diamond Beach in a dedicated car park with no signs suggesting overnight stays were not possible. If you are planning on doing something similar, please check the current situation. It is probably hard to believe that all of this was done in a single day. It seems this way partly because the south of Iceland is packed full of amazing locations to see, all within a small geographic area. Being only around 250 kilometres from Seljalandsfoss to Jökulsárlón, makes it perfect for an Iceland south coast self drive. Travelling in summer also extends the day considerably meaning you can stop more and stay longer, without ever having to rush. We started our day around 8 am and finished our day drinking a cold beer, cooled by the ice of course, on Diamond Beach at around 8.30pm. My pleasure Pablo, thanks for stopping by.